This is the first out of a series of three shirts I made using the same basic pattern. Download my basic pattern (for size medium) or draft your own using my tutorial. 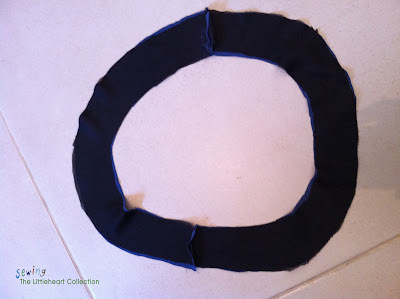 Cut out a front and a back piece of a lightweight, knit fabric. 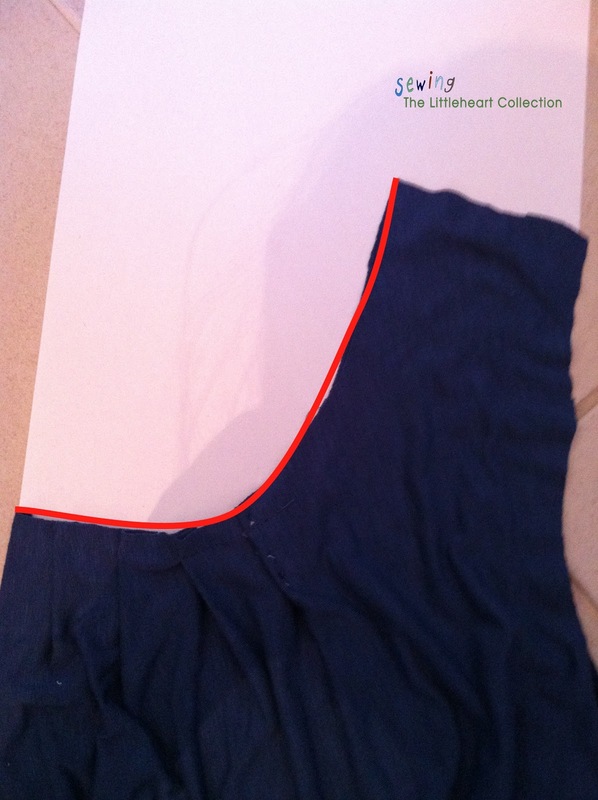 Cut out the sleeve option you would like to use. First we will make our pleats. Take your front piece and mark the middle. Then mark two inches to each side of the middle mark. Then mark three more marks on each side, each one two inches away from the last. In total you should now have 8 marks (without the middle mark). Now pin your pleats in place. 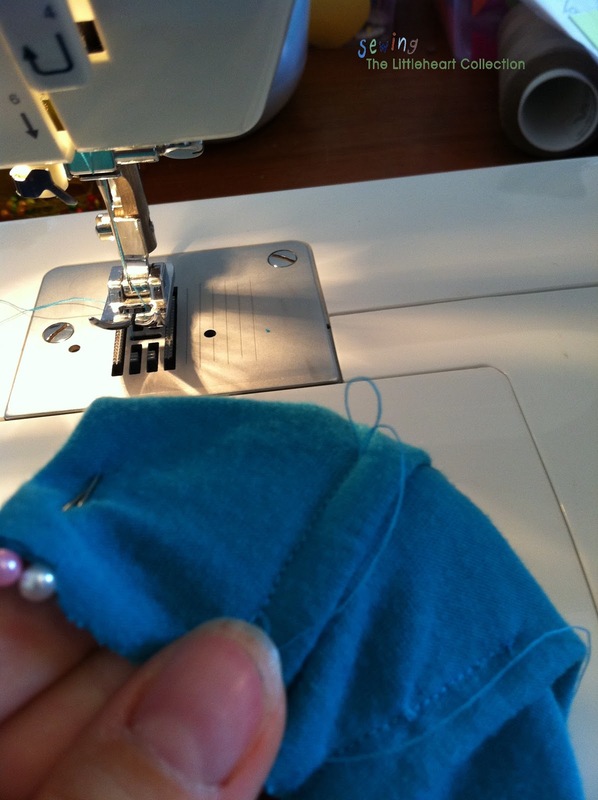 Starting with your mark furthest to the right, fold it over an inch to the left and pin. 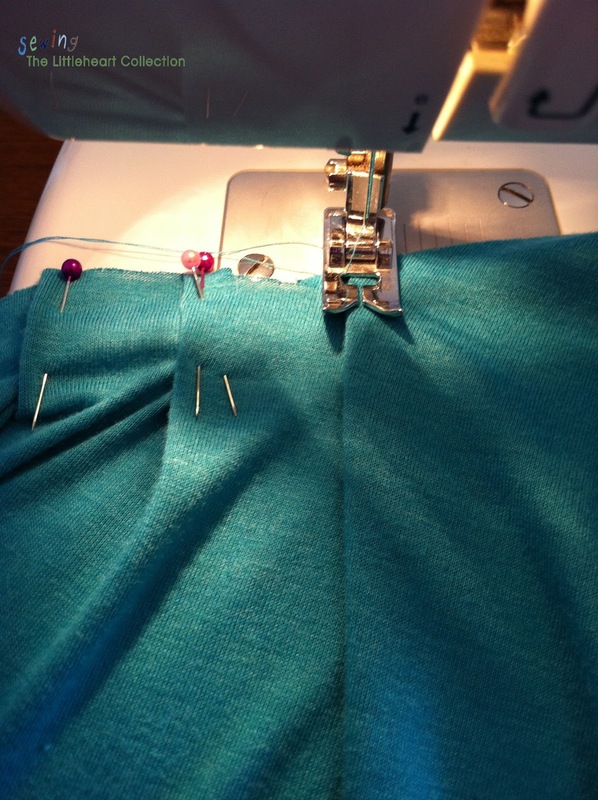 Do the 4 right pleats in this manner. Then go to your furthest to the left and fold it over an inch to the right. Do the other 3 pleats in the manner. You should now have four pleats folded to the left and four folded to the right. Now sew down your pleats, about an inch and a half from the edge of your neckline. Don't forget to backstitch to secure them in place. 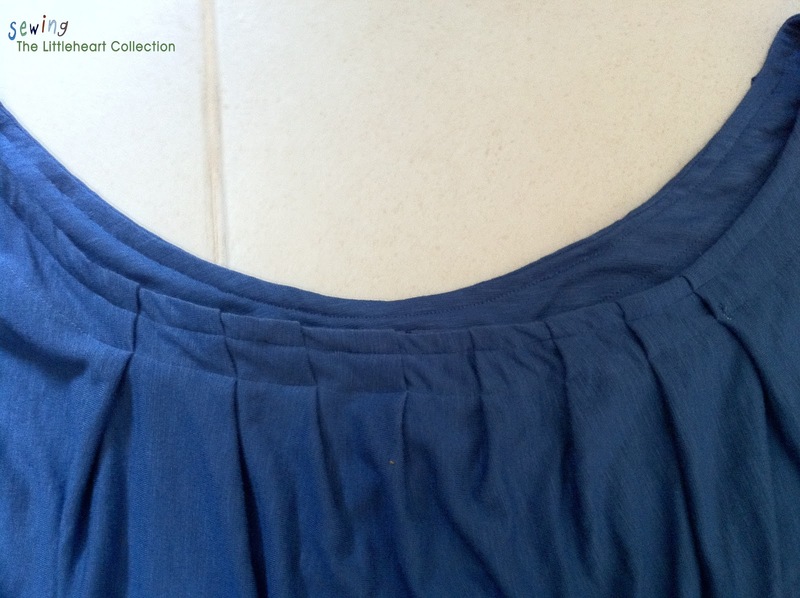 A little tip I learned from my mom: In order to get both strings to the back side of your shirt, so you do not have any strings hanging there in the front, pull the back string up towards the neckline and you will see that it forms a small loop. Pull out that loop with a pin and the front string will come back to the other side. You can now tie them together and cut them off. This leaves a clean seam in the front. Now you need to make your facing pieces. Take your front piece and fold it in half. 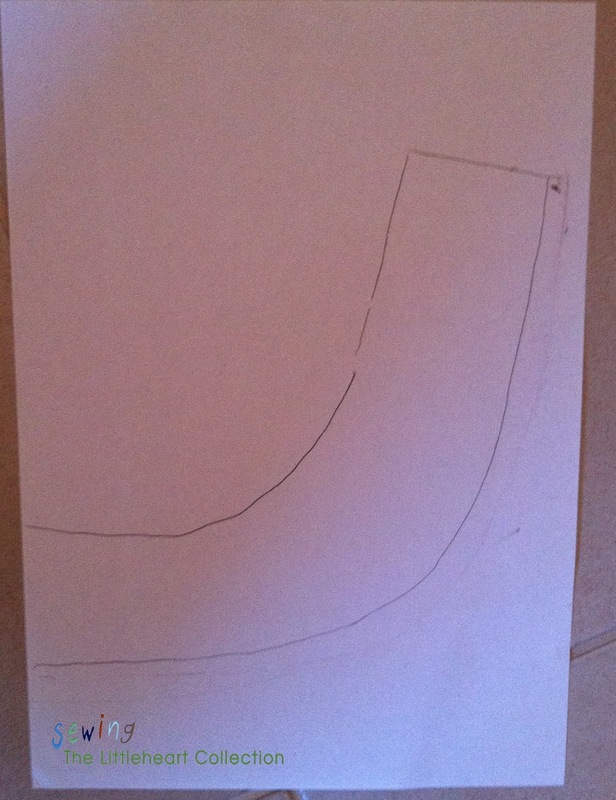 Place it on a piece of paper and trace your neckline, this is the top line of your facing. 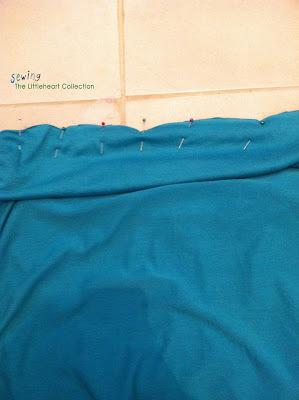 With right sides together, sew your shoulder seams. 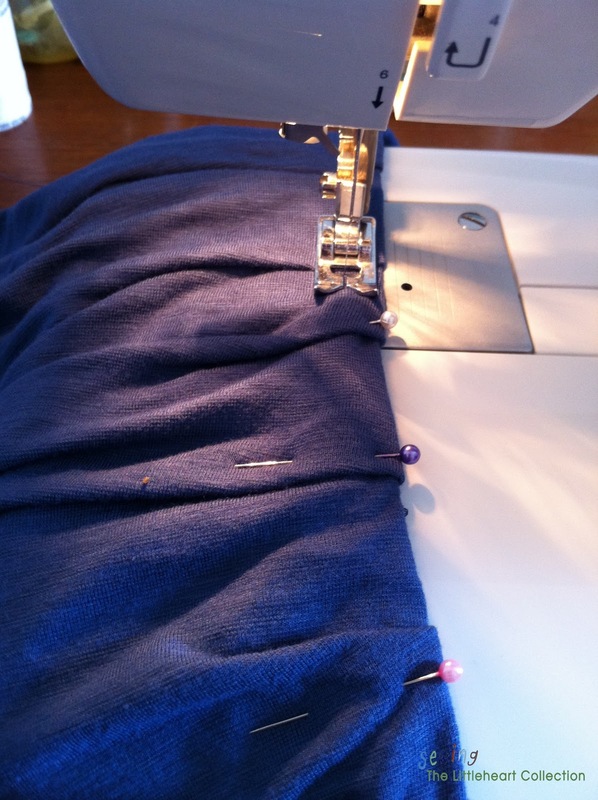 Cut each facing piece on the fold out of your knit fabric and your interfacing. Iron the interfacing to the wrong side of the knit fabric. Now take your facing and sew the short ends together, right sides facing. 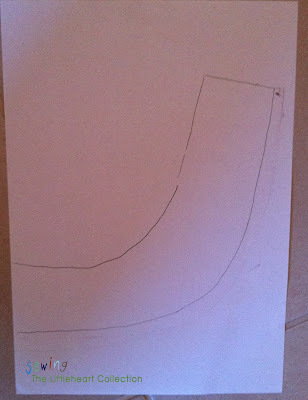 If you want you can serge or zigzag the edge of the facing, or leave it raw. You should now have a ring. 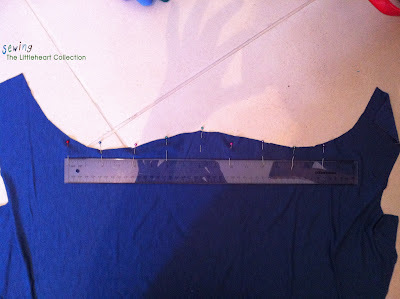 Lining up the raw edges, pin the facing to the neckline of your shirt. 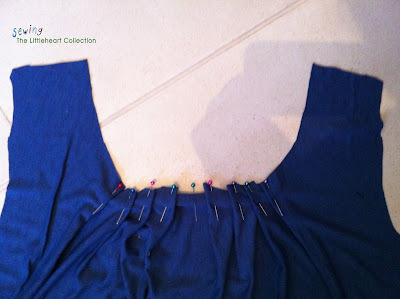 Make sure your front facing is pinned to the front of your shirt (where the pleats are). Sew the facing onto the neckline, using half an inch seam allowance. Clip close to the seam. Now fold the facing over and pin it down, pinning at each pleat. Topstitch half an inch away from the edge all around the neck, and then another half an inch away from that seam. 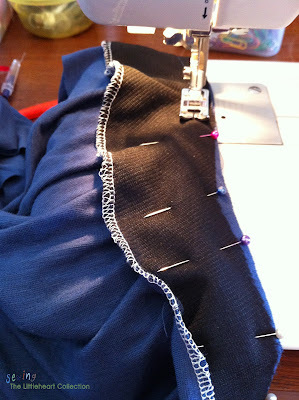 Make sure you get your pleats lying nice and flat. Press. You now have what looks like a tank top. Cut two long strips of your knit fabric, 4 inches shorter than the width of your bodice. Make them about 6 inches wide. Sew them right sides together on the short sides. You should now have a loop. Fold your loop in half and press. 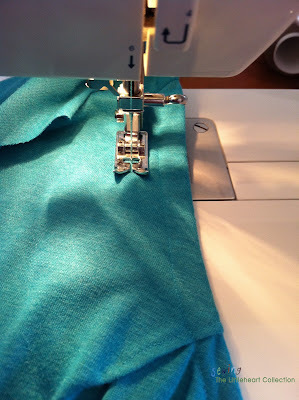 Now line your loop up with the bottom of your shirt, raw edges together and sew along the entire hem (half an inch seam allowance). Flip the band down and press. Now for the sleeves. Go back to my basic tutorial here and choose one of the options. Fabulous tutorial... clear and easy to follow. The t-shirt looks great. This looks great! Thank you so much for sharing. I just picked up a shirt at the thrift store with the pleated detail and I love it. I am totally making some now using your tutorial! Thanks! I love pleats! I know they're extra work, but I love the way they end up looking! I found your tute from Trendy Treehouse's link party, and this is awesome. I am pinning this for when I have time because it will go great with some of the skirts I've made this summer. You are welcome to check out those tutorials at thedomesticatedprincess.blogspot.com. Hi there! 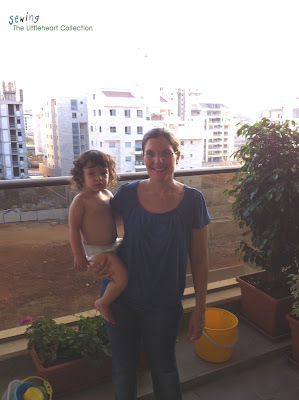 I blog at Blissful and Domestic. I just started a Re-Fashion Blogger page. This is where fashion bloggers can add their blogs to a directory. 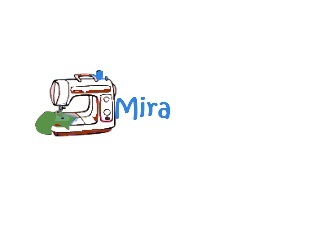 It is a great way to find fabulous fashion and re-fashion blogs. I would love for you to add your blog to the list. Thank you so much! fabulous tutorial! Thank You! I would love for you to share on my weekly Linky Party Blog Stalking Thursday! 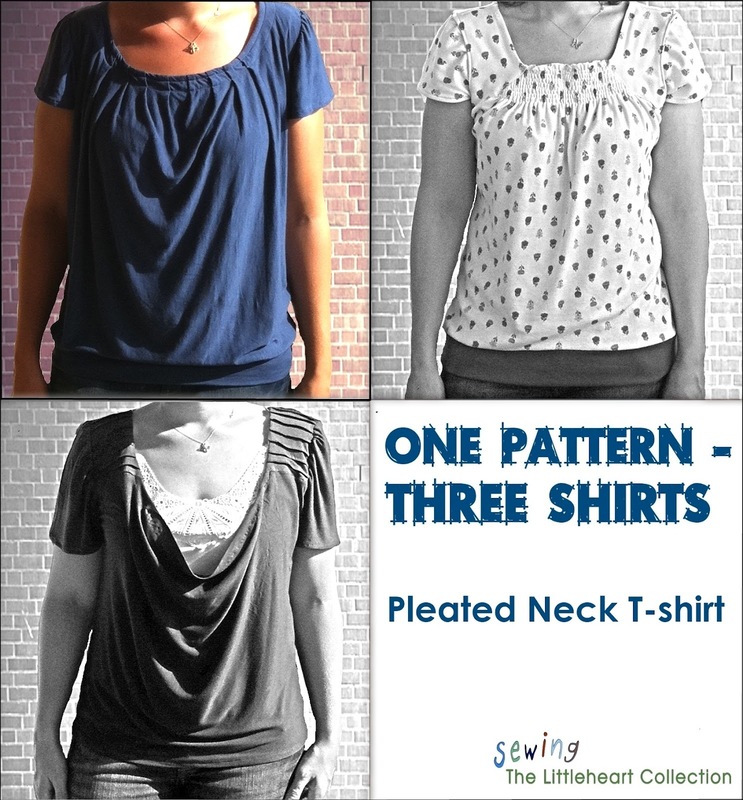 Love the Tshirt, and this is a great tutorial. I have a link party on Wednesdays, and I would love it if you would link this and any other posts. It is called Wednesdays Adorned From Above Link Party. It runs from Wednesday to Sundays. I hope to see you there. I would love for your to follow me also. Have a great Day. You are so talented! Thanks so much for sharing at the Tuesday To Do Party! Fabulous tutorial! very informative easy to understand.